This evening, we finished the first dive with the ROVs. The vehicles were brought back to the surface and lifted back up on deck. 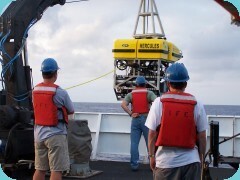 During the day, the ROV pilots had been collecting rock samples with Hercules robotic arm. The scientists at UW could see with Herc's camera, and tell the pilot which rocks to grab. With the ROVs back on deck, the scientists on board could finally see their samples up close. With the first dive complete, the Ron Brown began moving again to our next site â€“ Lost City.